Equipment Bin - The league keeps an equipment donation bin in the Walt Whitman fields shed. You are welcome to come and check out the items that are available, and take what you need. Or if you find yourself cleaning out your closet and getting rid of cleats, gloves or old playing pants that no longer fit, we will always welcome the donation for those who aren't ready to buy yet. Best time to sort through the collection is during league practices. Sliding shorts are compression shorts with extra padding on the thighs. A sliding pad offers protection for the knee that is bent. Both offer protection from abrasions or “raspberries” and should be worn with either shorts or softball pants. Metal cleats are not allowed in house ball. Batting gloves improve grip, protect the hands from blisters and absorb some of the “ringing” when the ball is hit. Must Bear NOCSAE Seal of Approval. 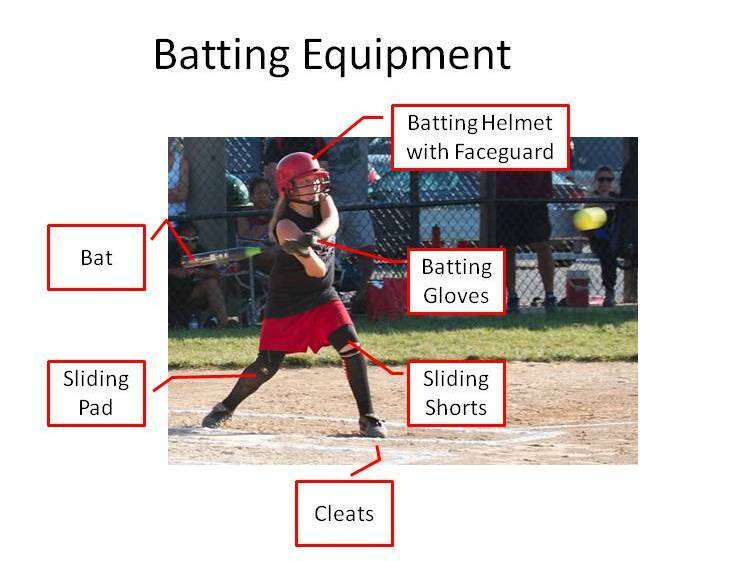 Players must wear helmets with faceguards and chin straps when they are up to bat and running the bases under ASA rules. Helmets and faceguards must be certified by NOCSAE, the National Operating Committee on Standards for Athletic Equipment. If your daughter's helmet does not have the seal on both the helmet and faceguard, she will not be allowed to wear it. Helmets are provided, but personal helmets cut down on the possible spread of head lice. Must Bear ASA Certified Seal of Approval. Bats are provided, but if you chose to buy or bring a bat, it must be an ASA Certified Softball Bat. Certified by the Amateur Softball Association. 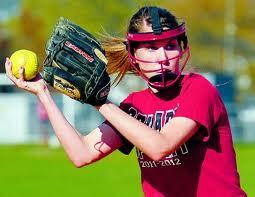 Pitchers are required to wear face protection. It is highly recommended that infielders in the 12U and 18U league wear face protection too. Based on Amazon.com, the Rip-It masks have the most 5 star ratings. Do your research and remember, the best mask is the one your daughter feels most comfortable wearing. Pick shin guards and a chest protector that fit tightly. These items should not be loose. Also, select a chest protector that gives some protection to your throat and clavicle. Your shin guards should have an extension at the bottom that protects all the way down to the tops of your shoes. Choose a Catchers Mitt, a soft glove with lots of padding to help save your hand from the sting of catching fast pitches. Also consider a bigger glove rather than a smaller one. While it is important to quickly dig the softball out of the glove when a runner is stealing, a bigger glove will offer you more protection. Consider adding a pair of knee savers to your shin guards. Not only do they give you some padding when you must go down to your knees, they also provide some extra protection because they cover the hinge of your shin guards.